Preheat oven to 350 degrees F. For dry rub, in a small bowl combine salt, mustard, espresso powder, pepper, garlic, onion powder, thyme, oregano, coriander, and celery seeds. Set aside. Rub oil over roast. Sprinkle the dry rub evenly over roast; rub in with your fingers. Place roast fat side up in a large roasting pan. 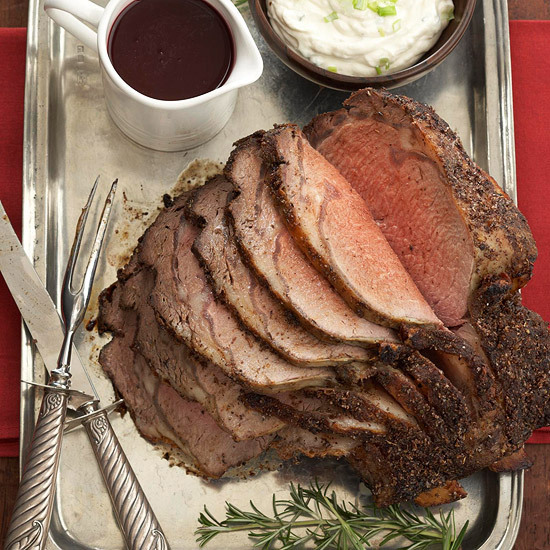 Roast for 1 3/4 to 2 1/4 hours or until meat thermometer registers 135 degrees F. for medium-rare doneness or 2 1/4 to 2 3/4 hours or until meat thermometer registers 150 degrees F. for medium doneness. Transfer roast to a cutting board. Cover with foil. Let stand for 15 minutes before carving.